Learn about Walt Disney World® Resort? Best new restaurants at Walt Disney World for 2017. Opens in a new window. Top 5 Walt Disney World hacks. Opens in a new window. Top 5 things to do at Walt Disney World for toddlers. Opens in a new window. Top 5 parties for dancing at Walt Disney World. Opens in a new window. Top 5 favorite things to do at Walt Disney World. Opens in a new window. Quick, reliable shuttles to the parks, clean rooms. Love the modern shower head! Convenient stores and restaurants nearby. Where to find Walt Disney World® Resort hotels near an airport? 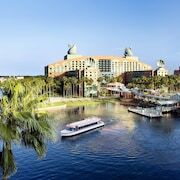 How can I find hotels in different Walt Disney World® Resort neighborhoods? 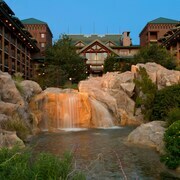 Where can I find hotels in Walt Disney World® Resort that are near tourist attractions? You can discover an extensive selection of short- and long-stay accommodation choices in Walt Disney World® Resort. Within Expedia's up-to-the-minute accommodation pages you'll discover 314 accommodations within a 0.1-kilometre (0.06-mile) radius of Walt Disney World® Resort's downtown. 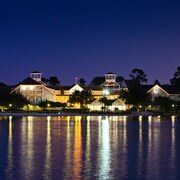 The Disney's Beach Club Villas and Disney's Yacht Club Resort are some of the more centrally located lodgings in Walt Disney World® Resort. Walt Disney World® Resort offers a selection of lower-priced hotel and apartment options sure to delight budget-minded vacationers and travelers. 4 kilometres (2 miles) from Walt Disney World® Resort's heart you'll find the Disney's Animal Kingdom Lodge. The Walt Disney World Swan is just 0.5 kilometres (0.3 miles) away. The Walt Disney World Dolphin and the Disney's Port Orleans Resort French Quarter are amongst the other cheaper places well worth looking into. You could try the Disney's Animal Kingdom Villas - Kidani Village and the Bay Lake Tower at Disney's Contemporary Resort. The Disney's Animal Kingdom Villas - Kidani Village can be found 5 kilometres (3 miles) from the center of Walt Disney World® Resort. The Bay Lake Tower at Disney's Contemporary Resort, is located 6 kilometres (4 miles) away. Some other hotel and apartment options in this area include the Boulder Ridge Villas at Disney's Wilderness Lodge and the Disney's Grand Floridian Resort & Spa. Why don't you enjoy more of the wetlands to be found in Central Florida? Opt to spend a few days in some of the other parts of Central Florida. Whether you engage in popular activities, such as hiking, or simply travel around to explore the attractions, you will be able to find comfortable hotel accommodation in the vicinity. 2 kilometres (1 mile) to the north of Walt Disney World® Resort you'll find Lake Buena Vista, where visitors can enjoy Lake Bryan and La Nouba Theater. 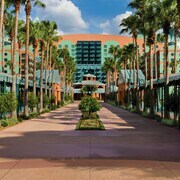 Lake Buena Vista accommodation options are the Disney's Old Key West Resort and Disney's Saratoga Springs Resort & Spa. 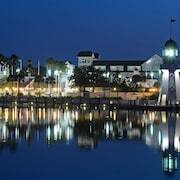 Or, you could consider staying in Sand Lake, 14 kilometres (9 miles) to the northeast of Walt Disney World® Resort, where you can choose from the Vista Cay Resort by Millenium and Hyatt Regency Orlando. The CoCo Key Water Resort and Star Trek: The Exhibition are a couple of the popular attractions to experience in Sand Lake. Orlando International Airport is a logical airport, and is located 25 kilometres (16 miles) from Walt Disney World® Resort. 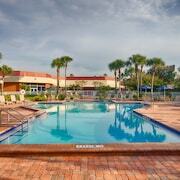 Nearby accommodation options are Hyatt Regency Orlando International Airport and Residence Inn Orlando Airport. 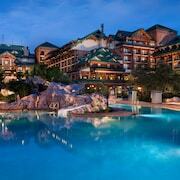 What are the most popular Walt Disney World® Resort hotels? 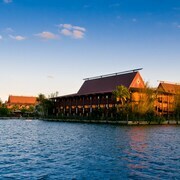 Are there hotels in other cities near Walt Disney World® Resort? 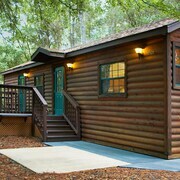 What other types of accommodations are available in Walt Disney World® Resort? Explore Walt Disney World® Resort with Expedia.ca’s Travel Guides to find the best flights, cars, holiday packages and more!